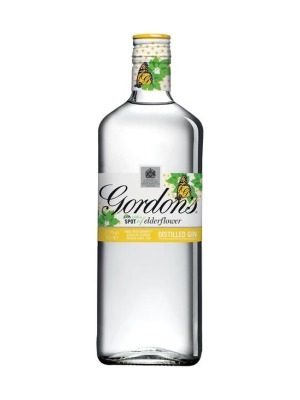 Gordon's Distilled Gin With Elderflower is a popular Gin available from Tesco Groceries in 70cl to buy online. Visit Tesco Groceries for the best price for 70cl of Gordon's Distilled Gin With Elderflower or compare prices on our other Gin products. Gordon's Elderflower gin combines the stimulating feel Original London Dry Gin well-adjusted with the muted affability of natural Elderflower flavouring on the nose piney juniper and floral, syrupy elderflower dominate.With the addition of tonic a refreshing, punch-style drink is created making for an enjoyable sundowner. Where to buy Gordon's Distilled Gin With Elderflower ? Gordon's Distilled Gin With Elderflower Supermarkets & Stockists. You can buy Gordon's Distilled Gin With Elderflower online in most retailers and find it in the Gin aisle in supermarkets but we found the best deals online for Gordon's Distilled Gin With Elderflower in Tesco Groceries, DrinkSupermarket.com, TheDrinkShop, and others. Compare the current price of Gordon's Distilled Gin With Elderflower in 70cl size in the table of offers below. Simply click on the button to order Gordon's Distilled Gin With Elderflower online now.